Before turning the calendar page to 2016, I'm taking a minute to reflect on what I learned in 2015. 1. Even for a fairly unsentimental person, losing my wedding rings last Christmas hurt my heart. I'm still praying to St. Anthony and hoping for a miracle. 2. I am not good at reading weather maps, or maps in general. Up until this past winter, it was part of my charm. But driving through blizzard conditions with 3 precious kids in the backseat made me want to get better in this area. 3. It's only hair. It will grow back. Just go for it, whether it's a dramatic cut or new color. And find a good stylist. 4. Find a cause you believe in and support it. For me it's earth care, and I support this cause through my work at Faith in Place. Your cause and the manner in which you support it may look different from mine, but it is no less important. Sometimes this will terrify you. Do it anyway. Your actions make a difference. Along the same lines, your dollars make a difference, from the food you buy to the clothes you wear. Become an educated consumer and support fair trade and sustainable companies when possible. 5. Everyone's a mess, some of us just hide it better than others. Don't compare your real life to someone's Instagram life. 6. I need to add (and claim) "writer" to my resume. I've had several things published this year through a series of good connections/dumb luck. But if I want to continue, I need to make more time for my writing. That might mean saying no to other things. I need to be OK with that. 7. 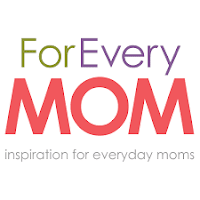 I made an audacious (at least for me) goal this year: to find a way to go to MomCon in Indianapolis and meet Jen Hatmaker. Through some hard fundraising work, saving, and planning, I made it happen. It feels so good to check things off my bucket list. 8. Something I heard from Margaret Feinberg at MomCon has stayed with me: "Remain suspicious that God is up to something good." Spending time in my busy day looking for the lovely breadcrumbs God keeps dropping just for me has brought pleasure to the mundane. 9. I cannot take enough pictures of my kids. Every one is a gift. 10. Wearing a dress for 31 days was not as hard as I thought. An unexpected takeaway: wear the nice stuff--the stuff you save for a special occasion--on ordinary days. People will wonder what you're up to. 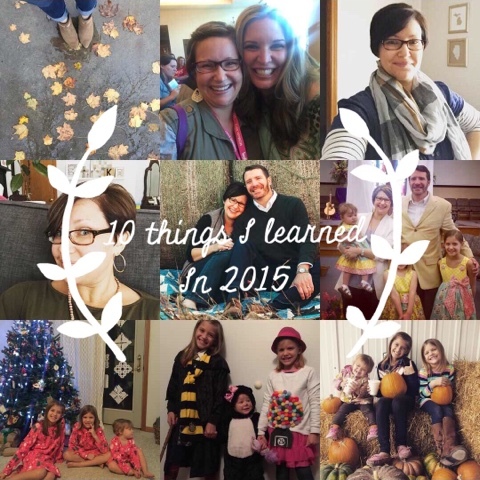 Your turn: what are your top 10 lessons this year? It's 30 degrees and sleeting on this late December day, but I'm wearing a knee-length floral dress. It's a slight inconvenience to keep adjusting my dress in the wind so as not to give the grocery store parking lot a glimpse of my rear, but my discomfort is a reminder that I have an embarrassment of warmer clothing options back home. But why torture myself? To make a point? And to whom? I've been participating in Dressember since Dec. 1. This project "uses fashion to advocate for women who've been exploited for their femininity. As women take on the creative challenge of wearing a dress for the 31 days of December, they are advocating for the inherent dignity of all women." I'll admit, it took me a bit to connect the dots on how wearing a dress could help women trapped in slavery and oppression around the world, but at its core Dressember is an awareness-raising campaign. My wearing a dress is making a difference, sending ripples of awareness through my circles of influence. 1. It was a creative exercise for me to put together 31 outfits wearing only a handful of dresses that I owned, and I found I enjoyed the challenge. 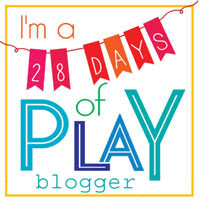 I tried to include an ethical/fair-trade item (like my Noonday Collection jewelry or Better Life Bag) each day. 2. I learned a lot about layering and tights/leggings combos (thanks, Pinterest!). 3. It turns out that wearing a jumper/skirt for grades K-12 didn't completely turn me off of wearing dresses as an adult like I previously thought. 4. I don't like my legs. I'm short and curvy, so dresses aren't usually my go-to wardrobe choice. But I learned how to style each dress to play up my assets. 5. When in doubt, wear a maxi-dress--it's as close as you can get to yoga pants. 6. Though this December was unseasonably warm in southeast Illinois, I was still cold most days if I had to spend any amount of time outside. Instead of throwing on pants under my dress to do outdoor activities, I just avoided such activities, which is a bummer. 7. I don't like taking pictures of myself. Though taking a daily selfie is not a requirement of the project, it's certainly good for publicity and raising awareness, so I did my best. But it felt self-centered when this campaign was meant to bring attention to other women around the world. 8. I found Dressember to be a great conversation starter. Any time my friends would ask if I was getting annoyed with wearing dresses yet, I'd redirect the topic to how other women don't have the power we have to choose our careers or life partners. 9. My oldest two daughters were proud of my effort and occasionally choose to wear a dress in solidarity. 10. This year, Dressember has raised over $600,000! Funds raised during Dressember 2015 support the work of International Justice Mission, and A21, two incredible human rights organizations that work to rescue and restore victims of slavery, sexual exploitation, and violent oppression. 85 cents of every dollar raised during Dressember will go to our partner organizations. 15 cents is retained for administrative, technological, marketing expenses, and credit card fees (It is standard for 501c3 nonprofit organizations to retain a percentage for overhead expenses). But I personally didn't raise much money. If you're interested in getting in a contribution, here's your chance! I think Dressember will become a yearly tradition. It helped connect me to the Christmas story, which, if you think about it, is that of a young mother in crisis. It reminded me that God can do wonders with an open heart. I encourage you to consider joining me. If you're trying to pare down your closet to a "capsule wardrobe", participating in this project might help you get started. It's not an exaggeration to say it's changed the way I think about getting dressed. What did you do this advent that drew you closer to the Christmas story? In what ways did you become more aware of the suffering or oppression of others this year? I get asked a lot of questions about what I do. It's a multi-faceted answer, but I'll try to nail it down for you: I'm a wife. I'm a mother. 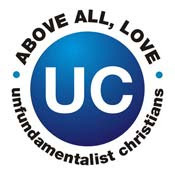 I'm a partner in my husband's ministry at Grace United Methodist Church in Neoga. And I'm an earth care advocate doing outreach support for Faith in Place, the Illinois affiliate of Interfaith Power and Light. Each of these roles requires a certain percentage of my time and energy, and every week those percentages change it seems. But I'm 100% committed to all of them. And each role is intertwined with the next--it's as if one cannot exist with the other, which makes saying "no" sometimes difficult. But I'm learning. 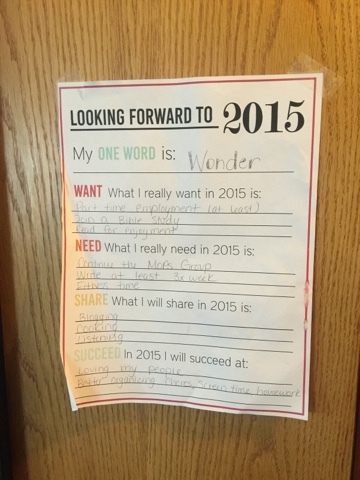 As I've reflected on my word of the year for 2015--wonder--I've also been looking ahead to 2016. 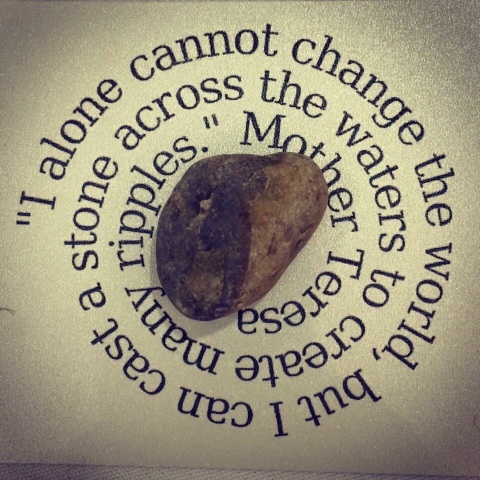 As I sat at the central Illinois fundraising event for Faith in Place two weeks ago, the word came to me: ripples. We watched the following video, which inspired me to wholeheartedly embrace how my actions create a ripple effect throughout my circles of influence: home, church, community, and beyond. This is such a freeing idea for me, that change doesn't rest on my shoulders alone, but it can start with me, and does extend out to those with which I interact. Are you feeling led to make some ripples? Want to know where to start? Contact me at christina@faithinplace.org. I can help start a conversation with you and your organization or congregation on how we can all take better care of the earth and each other. Last December, I chose a word for the year: wonder. I put my paper (from Thirty Handmade Days) where I would see it regularly--next to the mirror hanging inside the closet door--so every time I checked myself out I was faced with my goals for the year. It was a humbling experience. This year has embodied my wondering spirit in many ways. 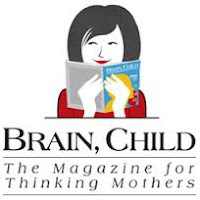 I've become more mindful of my bad habits and have done more thinking about my parenting than ever before. I've kept up with blogging and writing, which has promoted introspection and reflection. I found employment with an amazing non-profit and am using my skills in ways I never thought possible outside a classroom setting. I've deepened my relationship with Jesus through reading and scripture study, and though I still have questions, I now have more trust in the answers. So many things have gone right this year and after many years of struggle, I'd be lying if I said I hadn't begun to wonder if this kind of family, church, and career satisfaction would ever be possible for me. But as 2015 draws to a close, I'm far from done wondering, though much of my wondering lately reaches outside of myself and my home and extends out into the hurting world. I wonder about my influence in my community and how my one small voice might be used for good. I wonder how my small act of wearing a dress every day in December might save a woman somewhere in the world from a life of slavery. I wonder how I might begin to have conversations with people of different religions, races, or sexual orientations so that I might better understand their perspectives. I wonder how I might inspire others to see the moral obligation we have to take better care of the earth. I wonder if anything I do for my kids even matters (though I know better). What was your word for 2015? As you reflect on this year, do you see your word's influence woven throughout your story? The advent season is upon us and like many Christian families, mine looks for ways to prepare for the coming of the Christ child. We have an advent devotional we follow--the Jesse Tree--which I've previously written about here. We look for opportunities to perform random acts of kindness, which I've written about here and here and here. We keep the gift-buying to a minimum and try to make purchases from companies that are making a difference in the world, like those listed here. So why do we do all that? For hope. And peace. And joy. And love. These are the four words we focus on during advent, the ones written on our advent wreath, the ones we breathe in and out in anticipation of Jesus. In the brokenness of our world today, it's harder than ever to see hope, peace, joy, and love. But if you can't see them, you need to be them. That's why I've added a new advent discipline this year: Dressember. 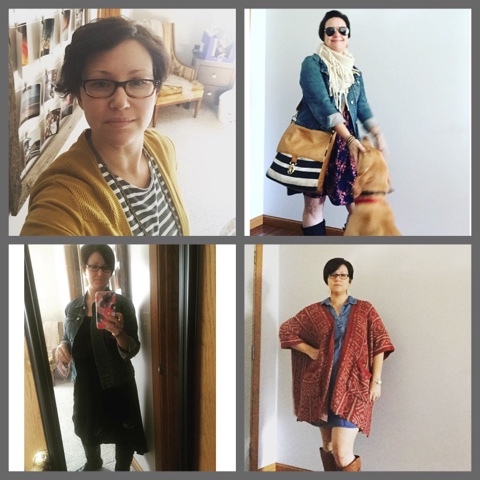 Dressember "uses fashion to advocate for women who've been exploited for their femininity. As women take on the creative challenge of wearing a dress for the 31 days of December, they are advocating for the inherent dignity of all women." So, I'm wearing a dress every day. In December. In the midwest. I'm as prepared as I can be. Here's what I'm afraid of: being cold, running out of outfit ideas, accidentally flashing the entire neighborhood bending over to pick up a child, and tights. But here's what I am hoping will happen: I'll find some inspiration and creativity in my own closet, I'll be reminded of how much choice I have as a woman in the U.S, I'll enjoy wearing my "nice" things every day instead of saving them for some undefined special time in the future, and I'll show my girls that we can make a difference right where we are by performing small acts of love. This idea seems to be catching on: On it's first day, Dressember has already raised $100K for A21 and IJM to rescue and restore women trapped in slavery internationally. If you'd like to contribute on this Giving Tuesday (or any day in December), click here to donate to my page. It's coming. Prepare the way.